Manufacturer of a wide range of products which include organic pesticide, herbal fungal management organic fungicide, herbal bacterial and fungal management organic fungicides, fungosin organic pesticide, fungosin and herbal bacterial management organic fungicide. 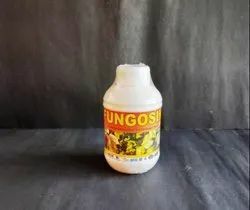 FUNGOSIN is a biotechnologically developed herbal product that provides effective protection against large range of fungal and bacterial diseases such as seed and soil borne diseases, like root rot, seedling rot, wilts etc, other diseases such as downy and powdery mildew, blights, rots, leaf spots, anthracnose etc. FUNGOSIN can be used as seed/ seedling root treatment, sugarcane sett treatment, tuber treatment and rhizome treatments, soil drenching. For over ground diseases FUNGOSIN is applied as foliar spray. All cereals, Millets, Grain Crops, Pulses, Oilseeds, Cotton, Vegetables, Potato, Sugarcane, Ginger, Fruit crops such As Pomegranate, Citrus Crops, Sapota, Oranges, Green House Crops, Green house with Soil drenching and Floriculture crops. Keep out of children reach and avoid skin and eye contact. Avoid spraying during hot sun. 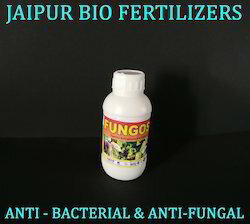 FUNGOSIN is a biotechnologically developed herbal product that provides effective protection against large range of fungal and bacterial diseases such as seed and soil borne diseases, like root rot, seedling rot, wilts etc, other diseases such as downy and powdery mildew, blights, rots, leaf spots, anthracnose etc. FUNGOSIN can be used as seed/ seedling root treatment, sugarcane sett treatment, tuber treatment and rhizome treatments, soil drenching. For over ground diseases FUNGOSIN is applied as foliar spray. Crops – All cereals, millets, grain crops, pulses, oilseeds, Cotton, Vegetables, potato, sugarcane, ginger, fruit crops such as pomegranate, citrus crops, sapota, oranges, green house crops, green house with soil drenching and floriculture crops. Dose – 1-2 ml per liter of water for foliar spray and soil drenching, Mix 2 ml per liter of water for seed treatment and 2-3 ml per liter of water for tuber/ rhizome/ sugarcane sett treatment. Safety Precautions - Keep out of children reach and avoid skin and eye contact. Store in cool and dry place. Do not expose to direct heat. Avoid spraying during hot sun. SHAKE WELL BEFORE USE. Compatibility - Compatible with other agrochemicals and fertilizers. Disclaimer – Since the use of product is beyond our control, manufacturer do not assume any responsibility other than the uniform quality of the product. Allcereals, Millets, Grain Crops, Pulses, Oilseeds, Cotton, Vegetables, Potato, Sugarcane, Ginger, Fruit crops such As Pomegranate, Citrus Crops, Sapota, Oranges, Green House Crops, Green house with Soil drenching and Floriculture crops. 1. Keep out of children reach and avoid skin and eye contact. 3. Do not expose to direct heat. 4. Avoid spraying during hot sun. Dose– 1-2 ml per liter of water for foliar spray and soil drenching, Mix 2 ml per liter of water for seed treatment and 2-3 ml per liter of water for tuber/ rhizome/ sugarcane sett treatment. Looking for Organic Certified Fungicides ?